Enjoy these Easter events in Portland! In case you already went all out on your kid’s Easter basket, here are free and cheap Easter events. Find an Easter egg hunt, brunch, or photos with the Bunny near your Portland neighborhood and neighboring cities. These events are free unless listed. Some of these events are from 2018. I will update them as soon as new events are posted. April 14 | 3-4 p.m.
Children wobblers-5th grade are invited to hunt for eggs filled with candy and small prizes, along with gold and silver eggs with numbers for special prizes at the St. Gabriel Episcopal Church. April 20 | 11 a.m. to 3 p.m. Gather at Jamison Park Square for activities for all ages. Partake in an interactive scavenger hunt, photos with the Easter bunny, and more than 25 events and activities. April 20 | 10:30 a.m. to 12:30 p.m. This 56th annual event has all the splendor of a springtime family tradition at the Alpenrose Dairy. The egg hun for 3-6 starts at 10:30 a.m. and 12:30 p.m. for kids 6-8. Please plan to arrive early since parking is limited. April 21 | 10:30 a.m. to 12:30 p.m.
A neighborhood Easter Egg Hunt for kids 8 and under at April Hill Park. The hunt will start promptly at 10:30 a.m. Everyone who participates is asked to donate filled eggs or fillings for eggs. April 20 | 1 to 3 p.m.
Head to the Regency Park Senior Living facility where every child will receive a bag to fill with Easter eggs! Snacks will be provided. Free raffle tickets will be provided to all attending children. Prizes include gift cards to Baskin Robbins, Build the Bear and Johns Incredible Pizza. April 20 | 10 a.m. to 12 p.m.
Stop by the gym at Bethany Baptist Church for egg hunting for the treasures and candy contained in the eggs, we will have; free face painting, balloon animals, popcorn, and cotton candy! The egg hunt begins at 10 am and is targeted to kids ages 0 to 10. April 20 | 2 to 4 p.m. The Ackerly at Timberland invites you to a fun afternoon of food, drinks and games. There will be a children’s Easter egg hunt as well as an adult version. There will also be raffle prizes and fun games. 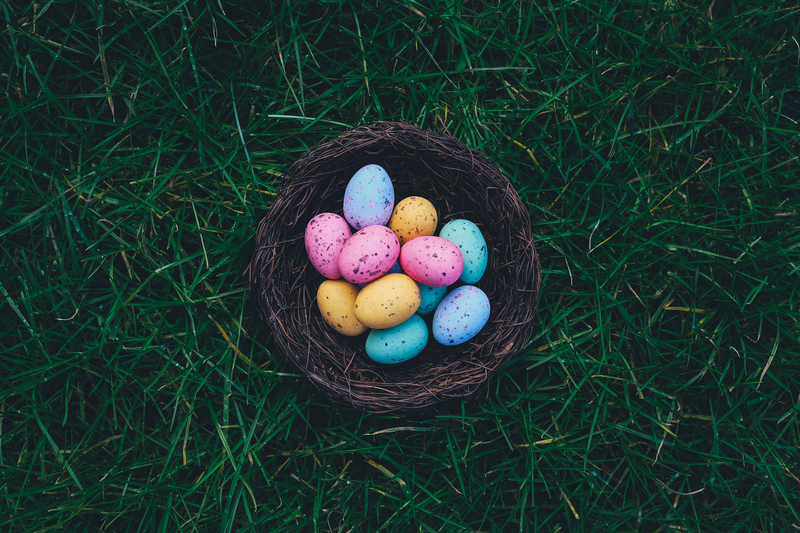 April 20 | 3 to 5 p.m.
Nordic Northwest is Enjoy an afternoon of egg hunting and other family programming with the local German organization. Free and open to the public. April 20 | 12 to 4 p.m. Walk around downtown Hillsboro collecting eggs from businesses. Enjoy live music and take a picture with the Easter bunny. Start your adventure at Study of Sweets. April 17-21 | 9:30 a.m. to 5:30 p.m.
Wednesday through Sunday, Jan’s Paperbacks will have eggs hidden throughout the store with treats and prizes. April 20 | 9 a.m.
Be there for the E.B’s grand entrance at 9 a.m. with different hunt times and categories starting at 10 a.m. at Donald L. Robertson Park. April 21 | 1:30 p.m. There will be 50 eggs each containing a golden ticket for up to $50 in Pix Treats. Doors open at 1:30 p.m. sharp on Easter Sunday at Pix Patisserie. All Ages. First come, first served. One egg per person. Free community Easter egg hunt! Partake in games, win prizes, and be on the lookout for thousands of eggs at Powell Valley Church. April 20 | 8 to 11 a.m. The Troutdale Lions Club is hosting the free annual event at Glenn Otto Park. Fuel up first with a hearty Pancake Breakfast from 8 a.m. to 11 a.m. Cost is $7 for adults and kids, $4 for seniors 60 and above, $3 for kids age 4-5, kids under 3 are free. The Annual Easter Egg Hunt begins at 10 a.m. SHARP! Get there early and take your picture with the Easter Bunny and find those eggs! April 13-14, 19-20 | 12 to 2 p.m. & 3 to 5 p.m.
Take a photo with the Easter Bunny and get a special Easter gift at the Bridgeport Village. $5 photos with the Bunny benefit the Chelsea Hick’s Foundation. April 20 | 12 p.m.
Four egg hunts with $3 per participant cost at Sherwood High School. This event is a fundraiser for those battling lung cancer. April 20 | 12 to 2 p.m.
Bring your basket and rain gear! This egg hunt is for anyone 21+ at Blakeslee Vineyard Estate. Entry fee is $20 per hunt, which includes a glass of wine. April 20 | 10 to 11 a.m. Kids 12 and under are welcome to participate! Bring a bag or basket to collect the eggs at the Oregon City Christian Church. Modified Inc invites you to bring your furry friend to “sniff” out eggs provided by “LaCookie” Gourmet Doggie Treats. Pawticipants are encouraged to come in your favorite bunny ears and pastel colors. Spots are Limited! Call Modified to reserve your spot at (503) 344-6947. April 20 | 2 to 3 p.m.
Head to this free egg and candy hunt for kids 12 and under. Make sure to bring your own basket or bag to Woodlawn Park. Enjoy a classic egg hunt and the beautiful grounds of the Historic Overlook House. April 20 | 10-11 a.m. Grab your children, arm them with baskets and get to Fernhill Park. Be there at 10 a.m. sharp! April 17 | 10:30-11:30 a.m.
It’s fun! It’s festive! It’s $5 for children 18 months to 5 years old at Peninsula Park. April 20 | 10 to 11:30 a.m.
More than 15,000 eggs ready for the hunt at Esther Short Park in Vancouver. Face painting and a bouncy will also be there for your enjoyment. April 20 | 9 to 11 a.m. Kids 0 to 11 are inviting to Glenfair Church for a fun morning of activities including egg hunts, bouncy house and more.